Bounce Battle Game is a family party game that gets the fun off to a bouncing start. Take your shot with ping pong balls: the object is to bounce the balls into the wooden game cube. There are lots of fast-paced ways to play, like Tic-Tac-Toe and H-O-R-S-E, or you can take shots against an opponent or work on solo bounces. Dimensions: 6.25" x 6.25" x 5.75"
My grandchildren just love this game. Got one for my house and theirs!!! Way fun for all ages. Can’t wait to take it on our trip this summer with the family. Fun game, played w/ my husband, son, daughter-in-law and grand daughter for a fun evening of game playing! We laughed a lot. Family has great time with it....I have to wait to get a turn to play. 5 of us enjoyed rotating and playing this game. Bounce Battle Game is a bouncing—and oftentimes ricocheting, rolling, and hopping—family party game that makes for a rollicking good time. 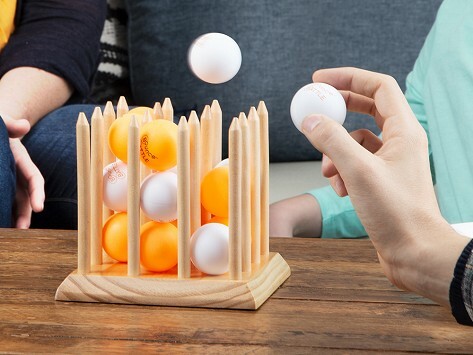 The object is to bounce orange and white ping pong balls into the wooden cube. Don’t think it’s that easy, there are lots of different ways to play to mix up the fun with classics like Tic-Tac-Toe, H-O-R-S-E, or new games like Alphabet Soup, Nine Cup, and Level Out. If you’re not feeling up to a game, you can practice taking solo shots. Maker Eric Held wanted to create a ping pong ball-based game that the whole family could play. Bounce Battle Game is the result of his creative drive to make something fun that also relies on a little strategy and good bouncing skills.